Last time, Pablo, a member of our community did a comparison between old and new electrical installations. This time he will analyze what are the most common problems encountered in electrical installations and how to solve them in order to get a better installation. Enjoy and you too send us articles by mail if you want to be published on the blog! There are several causes; poor design of the electrical system that causes the circuit demand is greater than the capacity of the breakers, also the end of the useful life of the interrupter. Likewise corrosion, dust, animals can cause hot spots and thus the trip; serious problems of earth leakage currents and other causes. 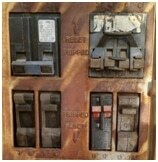 The most common way is to replace the breaker with a new one or in suitable conditions appropriate according to the characteristics of the panel. If the problem is the breaker itself then the problem will be solved this way, otherwise we must examine other causes. It is important to remember that an electrical installation should be treated as a system in which the failure of one of its parts can bring down the system, so you should not only focus on replacing the breaker or any other electrical product, rather do a complete inspection of the facility. The cause is due to several factors, some equipment or circuit has problems of insulation and conducts current to ground, as well not exist GFCI devices to open the circuit and prevent the risk condition. 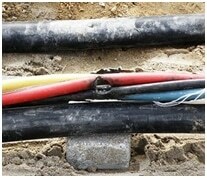 Also a cause could be that there is no effective grounding conductor. This condition may increase the risk of electrocution in wet areas such as kitchens and bathrooms. First you must find the cause and fix the problem, either insulation in poor conditions or equipment. Then the installation must be improved to prevent future occurrence, guaranteed the correct operation of GFCI devices and effective grounding conductors. This is one of the most serious problems for people who have children and pets because they are at very high risk of electrocution. Fortunately the solution is very cheap, spend a few dollars or cents to buy and install new coverage. This can be caused by a bad electrical design that result in voltage drops above the maximum permitted, also may be due to problems in insulation of the conductors that cause short circuit. Other causes are poorly fasteners tight in the case of bare conductors. If the problem is the main feeder you should contact the electric company and report incident. Is more complicated when it comes to poor design, the solution is to improve the installation changing all the wiring. This is a very common problem that I have met on many occasions. 2 or more (up to 8) conductors connected to the same switch or terminal lug, which is a violation of the rules, since generally the maximum number allowed is 2 (indicated on the breaker or panel). The main problem is a tightening without the necessary torque, causing hot spots in the connection. The solution is to add another panel or replace existing for another with the appropriate number of circuits. The main problem is associated with lack of connection of the equipment to the effective grounding conductor which has an effect on the risk of electrocution and power quality in case that the equipment requires a path for harmonic currents. 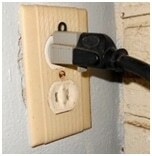 It can be fixed by changing all outlets and adding the effective grounding conductor. When it is not possible due to a high cost or because it is a construction with embedded wiring you can choose to install GFCI outlets. 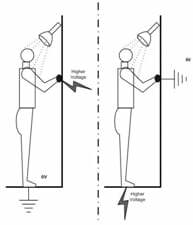 However in this case it should be considered the equipment does not necessarily need a path of grounding. While it is true that there are other problems related to old installations, I believe that the above cover the most frequent. It would be interesting to know that other solutions can be offered to some of the problems mentioned and other problems that you think have a high frequency of occurrence. What do you think about Pablo’s review? Do you know other way to fix those common problems? What other problems do you know? or copy this trackback: http://engineering.electrical-equipment.org/others/replace-electrical-system.html/trackback from your own site.